You’re invited to the Yaletown Mini-Market at Trees Organic Coffee and Roasting House in Vancouver’s Yaletown neighborhood (1391 Richards Street, at the corner of Richards and Pacific) on special days through November and December. Check out some unique holiday gift ideas and and support your local creative entrepreneurs, jewelry makers and other artisans. Stella & Dot Jewelry with Amy. Check out this unique line of jewelry that will help you accessorize in time for the holidays. Stella and Dot’s one of a kind collections are designed by celebrated New York designers and featured in Gossip Girl, In Style and Lucky Magazine as well as on the wrists and necklines of today’s hottest celebrities. Want to display your wares at the Yaletown Mini-Market at Trees Organic? 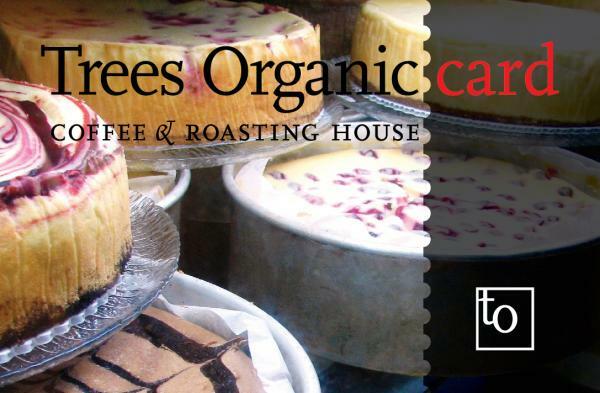 Are you a customer of Trees Organic Coffee and Roasting House in Vancouver? Do you have a home-based business and need a venue to build your business? Come and enjoy our coffee, award-winning cheesecake, hot apple cider, sandwiches, soups – anything you see in our café, with the convenience of a swipe card. Purchase or reload your card at any of our café locations in Vancouver and Richmond and easily check your balance at the till or online. Perfect for the coffee lover, tea drinker or café dweller in your family – and a lot more thoughtful than handing over wad of crumpled bills. Reload, reuse, rejoice! The whole family has come over for the holidays and they’re hungry. Spoil them with Vancouver’s best cheesecake. Everybody loves cheesecake – even little Timmy, who can’t be bothered to finish his yams. We serve it up in seven flavors, including the Sin (Belgian chocolate and sour cherries), blueberry, mocha, key lime, the classic New York style, plus the flavor of the season: Chocolate Orange! Gift bags of coffee beans! On a winter morning the day after the big party, wake yourself up with some organic fair trade coffee beans from the best coffee-growing regions on the planet. We’ve got beans from Peru, Guatemala, Colombia, Mexico, Costa Rica, Sumatra and more. Ask our café baristas to recommend the perfect beans for your special someone, whether they prefer something with full flavor, spice, smokiness or hints of flavor like chocolate. Catered soups, sandwiches, desserts and more for your office New Year’s party! Treat your Vancouver or Richmond-based office to our catered sandwiches, salads, specialty platters, cheesecakes, vegan desserts and more. Try some of our customers’ favorites, like Spinach and Chickpea or Tandoori Chicken wraps, bocconcini, Proscuttio & Brie, Turkey & Swiss and other tasty selections. If you’re in our neighborhood, drop by for some seasonal good cheer on one of our music nights!